I was developing a recipe recently for a very special upcoming cookbook, and I had the good fortune to stumble across a fact that has been quietly evading me for years: how to most deliciously reconstitute sun-dried tomatoes It came to a head this fall when I had the most delicious salad at the now-defunct (but soon to re-open!) Narru . A salad of gratineed goat cheese with sun-dried tomatoes and an amazing honey-sesame dressing. But how to replicate it at home without buying those expensive oil-packed sun-dried tomatoes? There's just some really bad information out there, given as gospel, much of which makes me laugh. (Julienne your tomatoes? Boil a large pot of water? WHY?) But seriously, even when Bittman hopped on the sun-dried tomato boat he evaded the question. 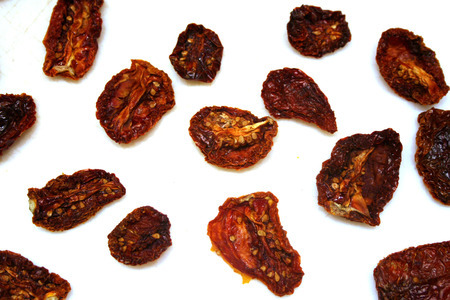 How do you make sun-dried tomatoes taste AMAZING? My answer came on the back of an unsuspecting bag of the stuff, bought in a little grocery store here in San Sebastián. And it was simple and surprising. A 2 to 1 ratio of water to VINEGAR. Skeptical, I tried it, and it was incredible. It produced that delicious tang tomatoes have in the bars and on the pintxos that I was trying to replicate. And the most curious thing? The instructions were in several languages on this package of tomatoes: italian, spanish, portuguese and english, among others. In almost every language they instructed the 2 to 1 ratio of water to vinegar. But the english instructions read: Hydrate in warm water. Only. Heat vinegar and water to a simmer. Pour over tomatoes, making sure all are submerged. Allow to sit for at least 15 minutes. Drain, drizzle with olive oil. Use in recipe, or just eat.